Well, it's back to life outside the 1%. No one dropped off breakfast at our door this morning. :( But, I think we'll live, even though we are having Arctic temperatures today. Some hardy friends got me out for a walk this morning. There's nothing like strolling through air that feels like 1 degree F to wake you up. I can finally blog about these, seeing as they have been gifted to my mom. They are not any old socks. I actually designed them! I wish I could remember exactly where I got the lace pattern. I think it's from one of the Barbara Walker books. I would have documented it if I had known it was going to come out so well! 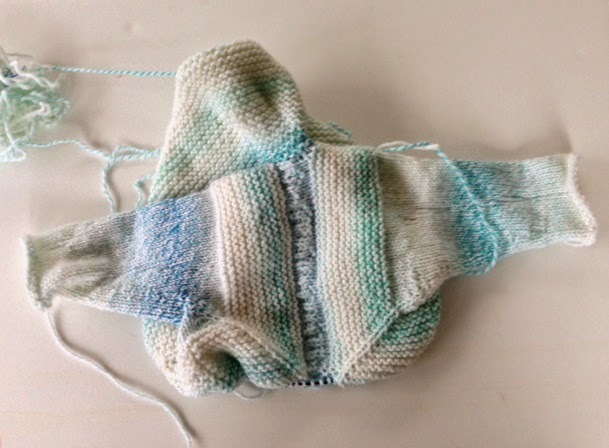 It's really a very basic, top-down sock. The lace pattern isn't complicated but I find it a bit slow-going. Still, I really love the socks. They are very textury (that probably isn't a word but you know what I mean) and squishy. I'm not sure how much of that comes from the pattern and how much from the yarn, Trekking XXL, one of my faves. Anyway, I'd like to put it out as a free pattern. Do I need to have it test knitted before doing so? I can't believe it's already the second Tuesday of winter break. How come vacations weeks go so much faster than work weeks? I'm linking up with Nicole and crafting on. 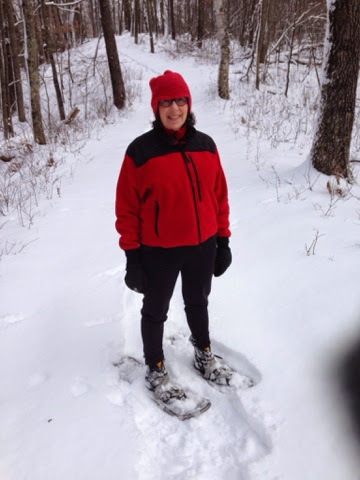 It was relatively warm yesterday -- in the 20's -- so we hit the trails. It was peaceful and beautiful. Notice that I am wearing a hand knit hat. The yarn is Madtosh but I cannot remember the name of the pattern -- just that it has been pretty popular! Judy asked if I have read Truck, which she says is set in Chetek. Shamefully, I have not read any of Michael Perry's books. I really need to get around to them! It is going to be hard to leave our little cabin tomorrow. But a predicted high of 9 degrees, will help motivate us to head back south! Keith and I have decided this is our honeymoon. 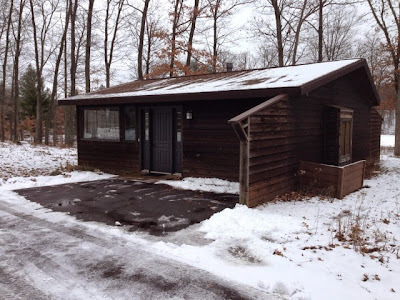 We are holed up on a luxury cabin in northwest Wisconsin courtesy in part of a gift certificate my brothers gave us for our wedding back in February. Canoe Bay is on the middle of nowhere, east of Chetek, which is north of Eau Claire, where I worked my first newspaper job. The cabin could not be cozier. 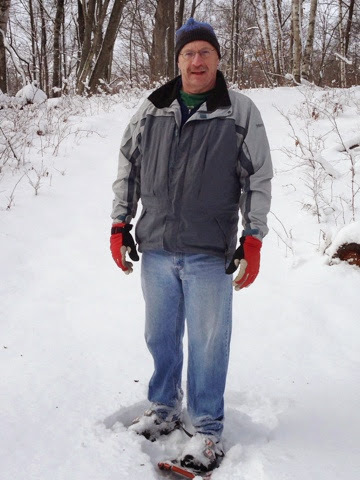 We had at least 2 inches of snow last night so I think we'll be able to snowshoe today. Breakfast was delivered to our door at 8 this morning! The best thing about Hanukkah is having my two children and my parents at my house at the same time. Seth looked so much better than he had during his vet school finals! I think he is also happy to have his sister home. We miss her! I had a "Jewish Christmas Eve" with friends -- that's a movie followed by Chinese food. We saw the movie "Wild" and really liked it. It's quite faithful to the book. And Christmas dinner with my in-laws is always relaxing and fun. My mother-in-law has the most amazing Snow Village that is set up on every horizontal surface she can find. I'm ready to do nothing for a few days -- no cooking, no cleaning, no planning! I hope you also are having a wonderful holiday! 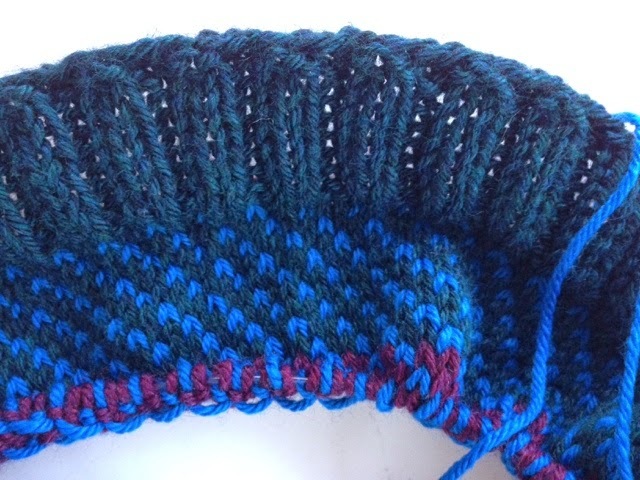 This project is helping me improve my speed on two-color knitting -- not that I'll ever be near fast. I have given up on the ideal two-handed style; I just can't knit with my left hand. Instead I've developed my own quirky style, which would surely disgust Alice Starmore. But it works for me and I'm OK with the speed. The cowl seems like it's kind of a weird size, but I won't be able to tell until I finish and block it, so I'm not worrying about it yet! Today is my family's official Hanukkah celebration. I loved having all eight days when my children lived at home, but now that isn't going to happen. 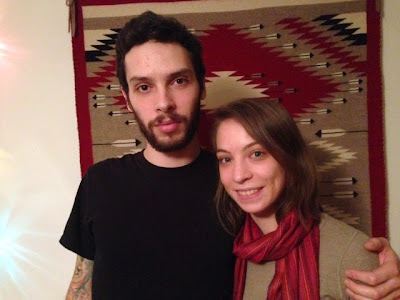 They both had finals for the first few days, and Rachel was in Miami until hers were done. However, both of them, and my parents, will be here later today for latkes, candles, and gifts! 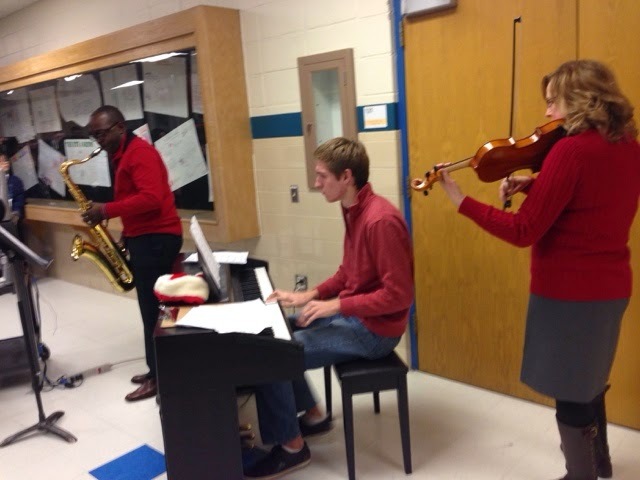 The guy on the right is our principal and some of our music teachers are joining him in a spirited holiday concert. I felt so lucky to be standing there, surrounded by my awesome team members and swinging to this trio. It's a rough time for teachers, but I can't imagine another job that would have the same high points. I'm enjoying my first day of break and I'm sure I'll enjoy every single day ... but I'll be happy to see my fellow teachers when we go back next year. I think I bought the pattern and yarn for the Clinton Cowl a few years ago. It's a Borroco pattern and the yarn is Berroco Vintage. When I bought it, I was worried it was too hard for me, which is probably why it sat around for so long, just languishing in my stash. Something -- I don't know what -- inspired me to dig it out (which wasn't all that easy as I have my stash stowed away all over the house). I started knitting and -- it's not so hard after all! 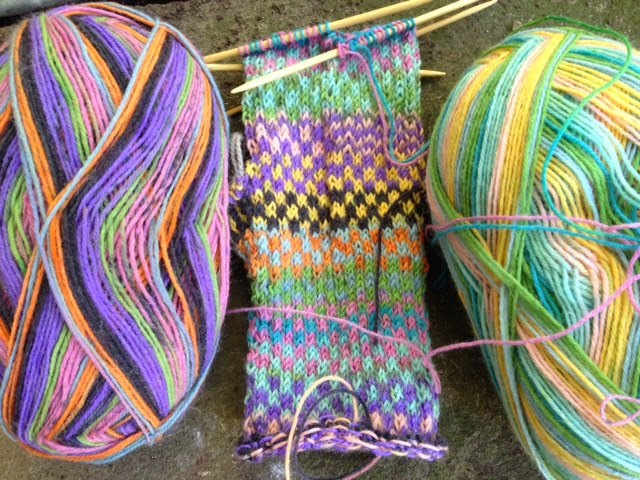 It's a simple Fair Isle pattern, with stripes that spiral. There are 8 colors in all, so it shouldn't be a boring knit. 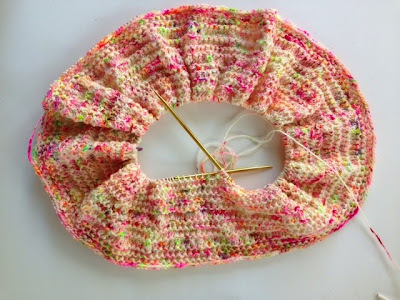 I've started the third season of the Killing, so I can see this cowl just flying off the needles. And the week is flying by -- just two more days until winter break! I can't wait to do nothing but read and knit! And make cookies, of course. Do you think it would work for a boy or a girl? 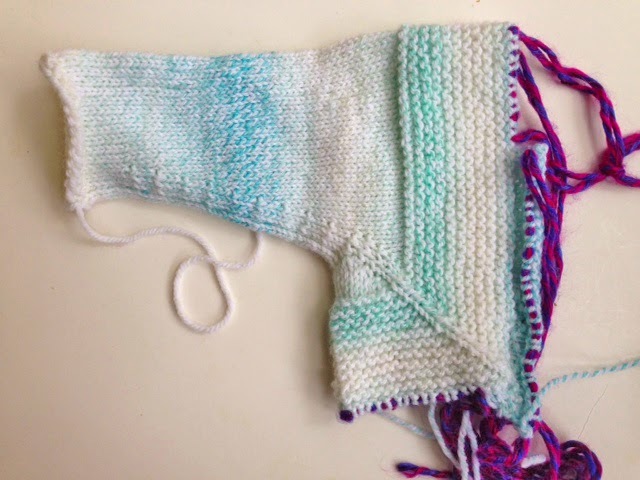 I don't have a recipient in mind; I knit it for the practice of making a sweater, so I tried to find yarn that would feel right for either gender. I'm sure a special baby will come along one of these days. It's a quiet weekend here, which is nice before the holidays. I went for a walk and lunch with friends this morning, then came home and cooked a Mushroom Marsala recipe from Fine Cooking. It was good, but not great. I haven't decided if I'll keep the recipe. I love chicken Marsala, so it would be nice to have some other uses for a bottle of that wine. I hope you are having a peaceful pre-holiday weekend! 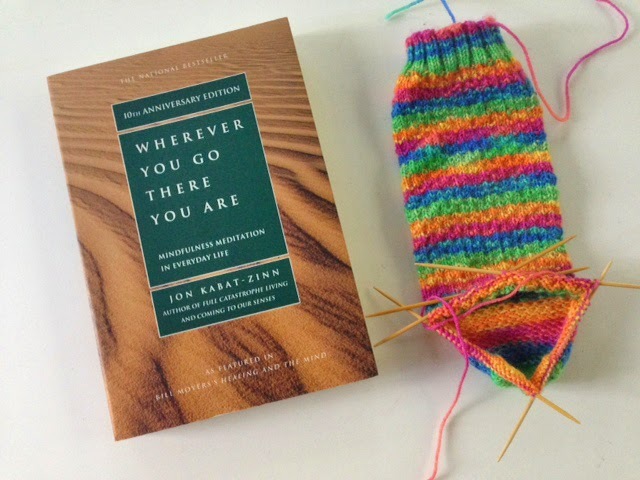 I started this sock back in August when I went Up North with my friend Joni. 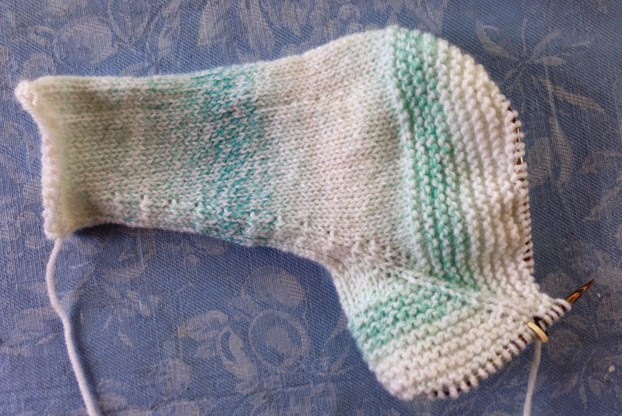 It's the first of the Wishbone Socks. At this point you may be wondering, how many WIPs does Caffeine Girl have going now? Well, I don't know if I can count that high. I've realized there is a pronounced chaos to my knitting. I like to have lots of choices when I have some time to knit. 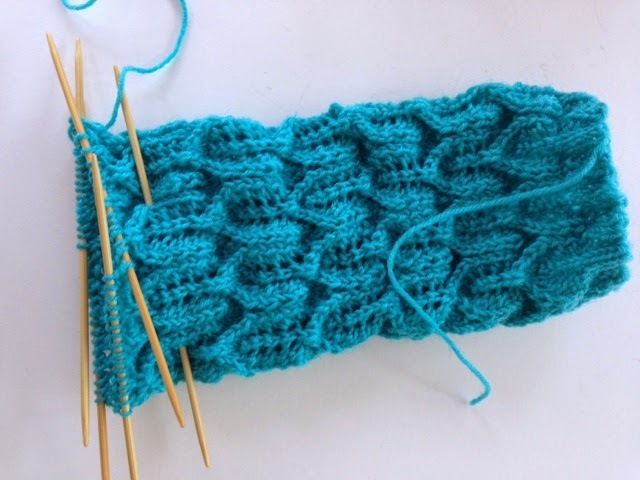 But there are also categories that I like to have WIPs in: easy knitting for socializing or watching TV; moderately challenging for listening to the radio or podcasts; and challenging projects that take my full attention. Still, that would only require me to have 3 WIPs at any time ... and I have a large multiple of that number sitting patiently in project bags. I seem to have a weakness for starting projects. It's sort of like how I feel about buying books. Buying a book is a commitment to read a book -- and I like that feeling. I get the same satisfaction from casting on. Oh well, there are worse vices! I'm linking up with Keep Calm and Craft On here. 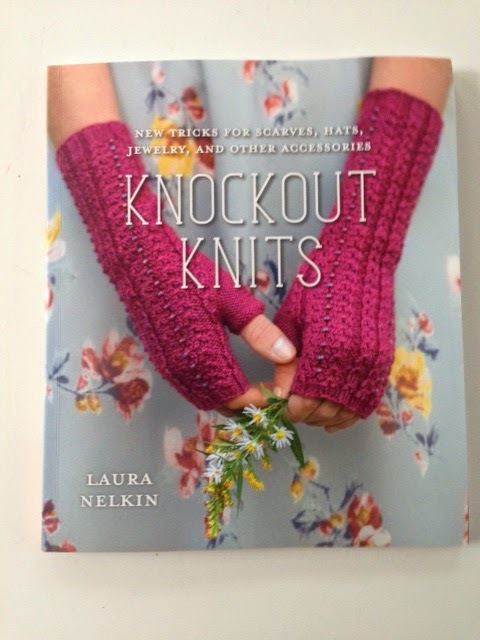 If you read MereKnits -- and who doesn't? -- you know all about the Almost Forgotten Dishcloth. 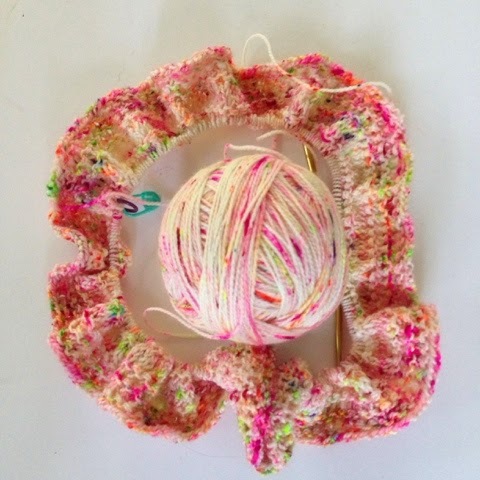 While Meredith didn't design it, she has inspired knitters all over to jump on the bandwagon and start spitting out these darling cloths. I knew I'd jump on sooner or later and now my first one is ready to sew up. Very sweet, huh? I knit this out of Lily Sugar'n Cream but I didn't realize until I started that this skein is part of the scented line. The scent is quite nice -- like freshly washed laundry -- but the label says that it washes out. I'm thinking these will be perfect little gifts for thank-you's and other small occasions. It's downright hot here -- 35 degrees F, a little above freezing, so I want to squeeze in a walk. I have a hard time exercising during the school year -- and I know I should make it a priority! After that I have to clean the house because I'm hosting my meditation group this evening. There is something not-quite-right about hurrying to get ready for meditation -- but I don't know how to get around that! It has been another crazy week. Our secretary pointed out that crazy weeks have become the norm, and there's a lot of truth to that! I've been playing catch-up most of the week because I took off Monday to go to Chicago for the funeral of a close friend's mother. I knew Fran, the mom, a bit and I had really liked her. Still, I was unprepared for how emotional the funeral was for me. It wasn't my mom, after all, but I found myself deeply saddened by the thought of a world without Fran. And I was struck by how primal this feeling was, how inescapable, how deeply universal it felt. I am as guilty as anyone of being wrapped up in getting through each day, completing the tasks, making the phone calls, handling the problems, figuring out what to make for dinner and when I'll have time to clean the bathrooms. Going to this funeral really disrupted my usual monkey mind. It is so easy to forget the things that really matter. Since Monday, I have been thinking a lot about how I spend my time and how I want my life to be. There's a lot of think about. ...foot traffic is way down this afternoon at my art fair! The place was pretty crowded this morning but things slowed down quite a bit about an hour before kick-off. Last year I did very well at this show. This year I'm just glad that I am not losing money! 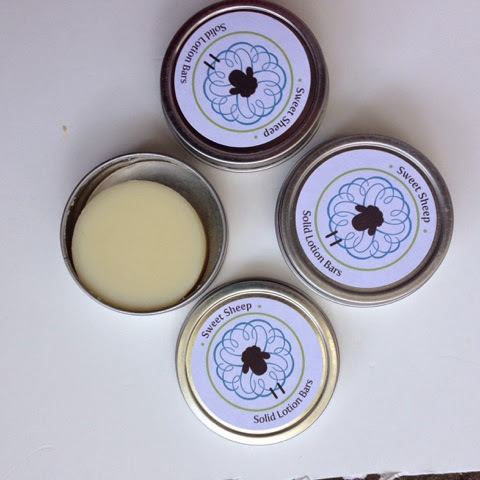 Earlier this year, I was lucky to receive a sampling of lotion bars in the beta stage. 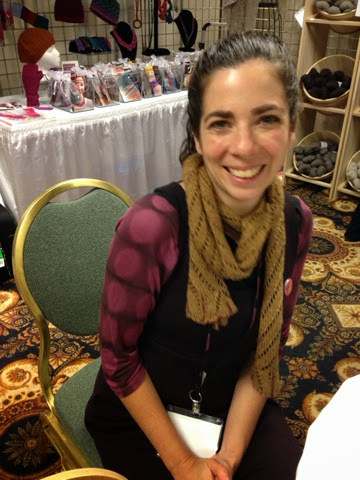 Maker and blogger Alicia Landi of Woolen Diversions was looking for feedback on three different samples she had made. 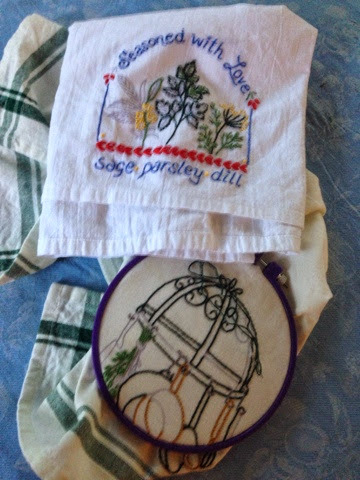 I was not a very helpful sampler, though, as I loved them all! This is great stuff. At the risk of sounding like a paid ad (which this is not! ), I can say that it's not even December and the air here is cold and dry. My Sweet Sheep Solid Lotion Bar is keeping my hands from being painfully dry! The bars are handmade from all-natural ingredients, like cocoa butter, mango butter, sweet almond oil, coconut oil, meadowfoam oil, and vitamin E oil as well as lanolin. And the scents are amazing! I pulled a Turkish Mocha-scented bar out of my purse recently when I was at a restaurant with friends and everyone at the table was seduced by the scent. They all wanted to know how they could get one of these. I bought enough for all the women in my family for Hanukkah (none of them knit, so I don't think I'm giving away anything). By now, I'm sure that you want to know how you can get your dry, chapped hands on one of these. It's easy because Alicia has an Etsy shop here. The only problem you'll have is deciding which one of the amazing scents you want. I do highly recommend the Turkish Mocha, but I don't think you can go wrong with any of them. And speaking of shops, I have my one craft fair of the year tomorrow. It's a great show that benefits Madison's Arboretum and the show features only local producers. You can get everything there from clothing to organic honey to jewelry. I have been taking it easy this weekend but I'm going to have to get going today. I hope your Thanksgiving was lovely. I am always happy if I can have both my children at the table at the same time. Seth lives here in Madison, but he's in vet school so I don't see a lot of him. Rachel is in grad school at the University of Miami and she did not enjoy the wintery weather here. Still, it was great to have her home. She flew back yesterday and the house is too quiet without her. And finally, the thanks. Even though I grumble way too often, I know that I am very lucky to have wonderful friends and family, a solid roof over my head, and enough money that I don't have to worry about paying the bills. 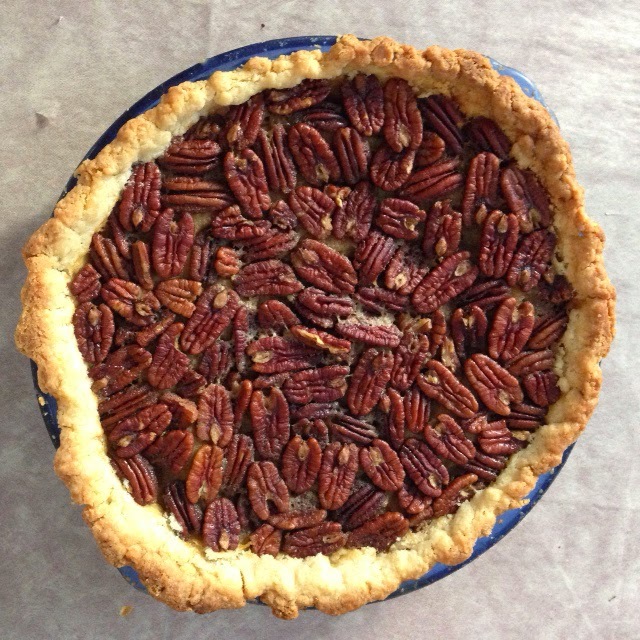 I hope that Martha Steward's Pecan Maple Pie is as good as it looks. I've got a date with a large and awkward turkey, so I'll sign off wishing you a happy and delicious holiday. 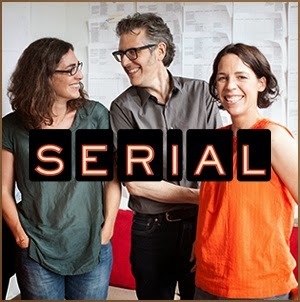 Serial is a true story told over the course of a season. A spin-off from This American Life, Serial focuses on the murder of a popular high school senior who was murdered in Baltimore County. Adnan Syed has spent 15 years in jail claiming he didn't kill her. Did he? Or is he doing time for someone else? One of the things that makes this series so riveting is that the producers don't know the answer. They are reporting in real time, so they are just as mystified and curious as the audience. We get to follow their trail, listen in on their interviews with everyone from Adnan to police, and consider all the angles. I also found a great Guardian article listening more great podcasts. You can check that out here. If you'd like to be part of my Fall Giveaway, leave a comment for me by 6 p.m. on Sunday! The pattern calls for the Kitchner Stitch. I can Kitchner. I have closed up countless socks and a fair number of mittens this way. But this is 36 live stitches -- 72 if you count both sides. My worry is that I'll lose track of where I am. I figure I need to find a time where I will not be interrupted. Easier said than done! And no listing to podcasts. I still have a long ways to go on this project. 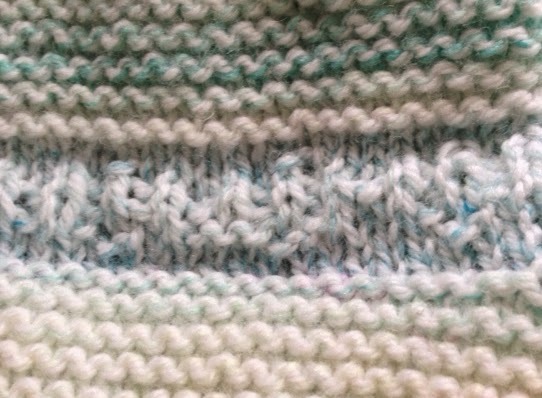 I have to knit a border and add a hood. Luckily there is no deadline. I hope your week is going well. Mine has been unusually uneventful. When you're a special ed teacher, that's a good thing! Don't forget to comment on this post to be part of the Fall Give-away. 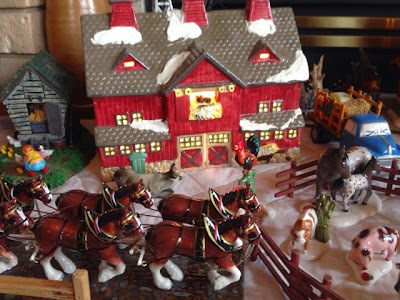 I'm linking up with Frontier Dreams and Small Things. Seeing as I've done quite a bit of stash enhancement lately, it feels like the right time to lighten up that same stash, so I've put together a fall sock "kit." 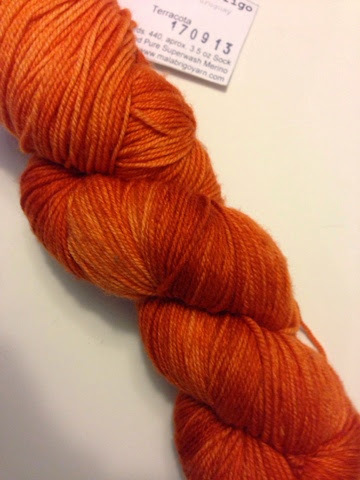 First up, some autumnal sock yarn, Malabrigo in Terracota. 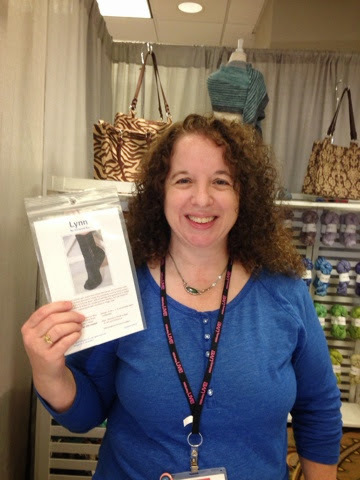 The pattern is called Lynn and designed by Adrienne Ku. I saw a completed sock at Vogue Knitting Live Chicago a few weeks ago and just fell in love with it. I actually bought two of the patterns so I could use one for this giveaway. It's a very elegant pattern and quite dramatic -- but without any weird architecture! There are only a few projects (so far!) on Ravelry so you can see a little more about this pattern here. 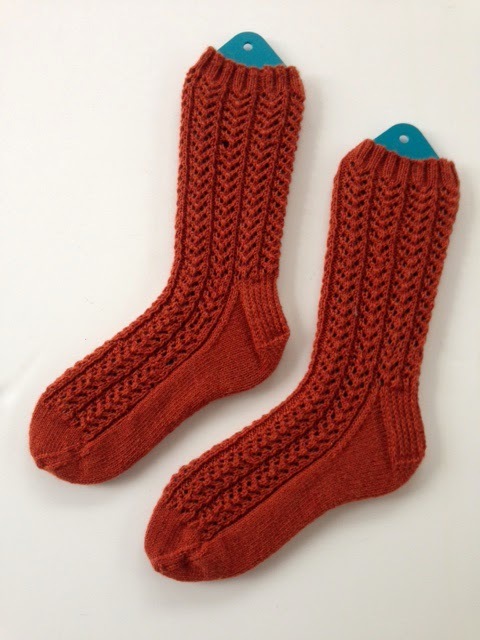 Adrienne Ku of Mushroom Knits designed the very popular Simple Skyp Socks, which have been knit by 3,577 people on Ravelry so far, so I'm sure that this will be a well-written pattern. To participate in the give-away, just leave a comment on this post by 6 p.m. on Sunday, November 16, and I'll use some method of random selection to pick a winner. Do give me some way to contact you: email, Rav name, etc. If I already read your blog, I know where to find you! Well, it's Sunday night. The weekend sure went fast. We went out to dinner with my parents; visited Keith's parents; and saw the movie Birdman, which is interesting but kind of odd. 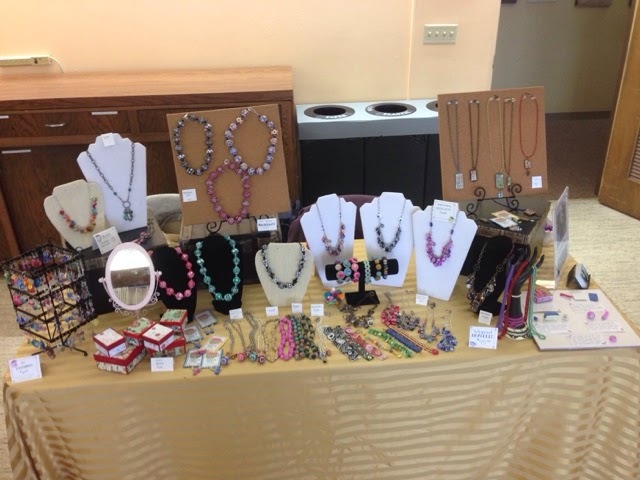 Because I'm going to be in a holiday show at the end of November, I spent a lot of time making jewelry, both by myself and with friends, which is MUCH more fun! This yarn is downright yummy. I haven't decided yet if this Jetsetter cowl is for me or a gift. Am I the only one who has trouble making this decision? I didn't expect to take a full week to blog about my trip to Vogue Live Chicago last weekend, but I did. I attended a school board meeting Monday night and waited three hours to speak! I got to bed late that night and spent the rest of the week in a state of sleep deprivation. 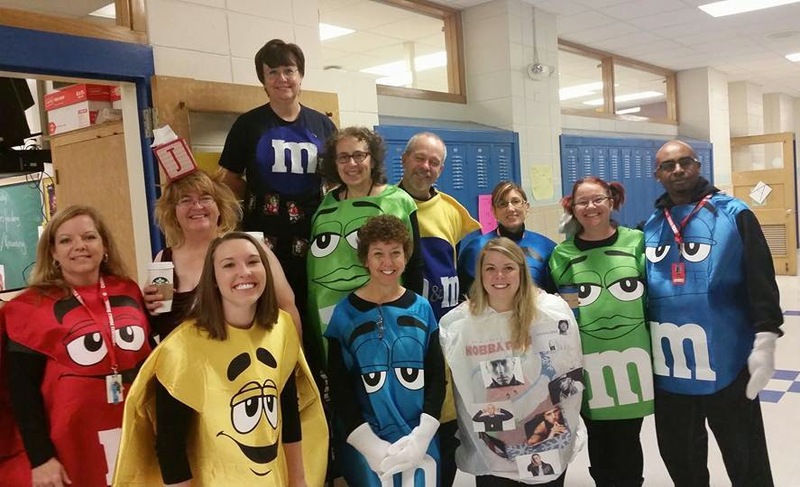 The week ended on a high note with the entire 8th-grade team dressing as M&Ms. Yes, there was shopping. I know. I know. I said I was going on a yarn diet after the Sheep and Wool Show in September. But now I really have to stop shopping! 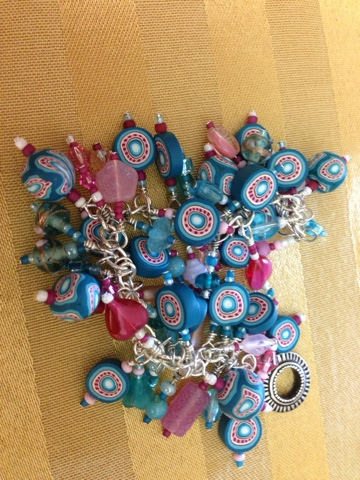 I've long wanted to try my hand at crocheting with beads. Seeing as I know nothing about crocheting, I need to start with something simple. 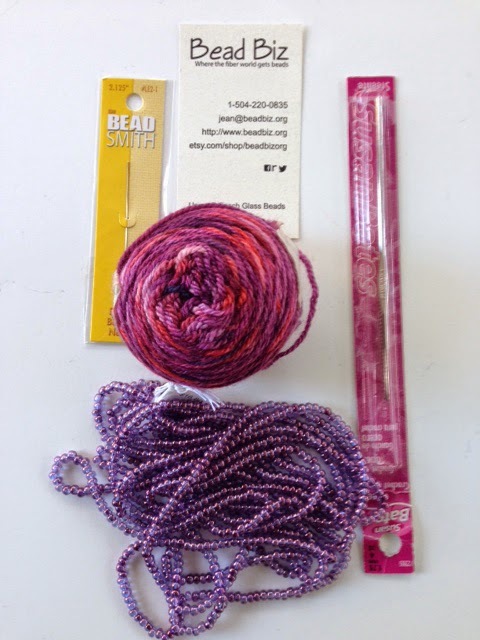 The lovely ladies at Bead Biz set me up with these supplies and instructions for a simple bracelet. I picked up this kit from Windy Knitty. 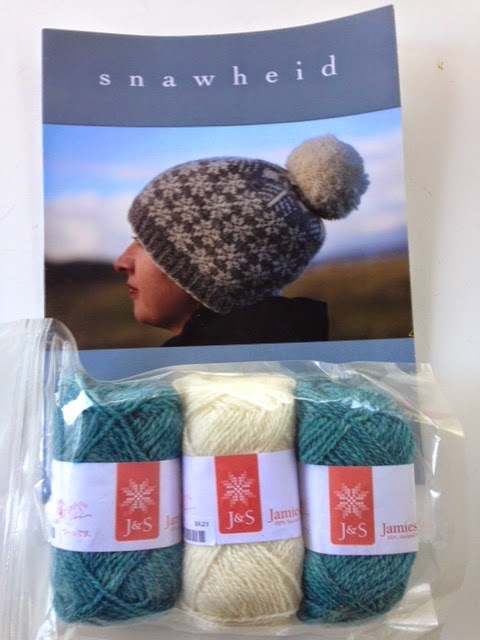 It's my first experience with the famous Jamieson & Smith Shetland wool. Kate Davies designed the Scandinavian-style hat. I love the design -- sans the pompon. There is a photo inside the leaflet of the crown without the pompon, and I like that much better! 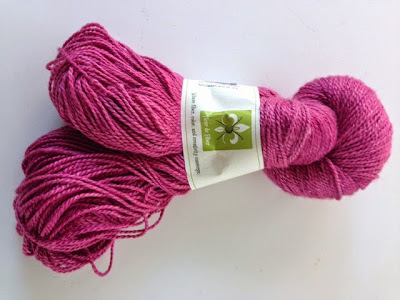 At least I'm not buying random yarn anymore. I do think I'll knit every one of these ... eventually. And last, here are the M&Ms. The students really got a kick out of our costumes. I am so lucky to work with an amazing group of teachers! 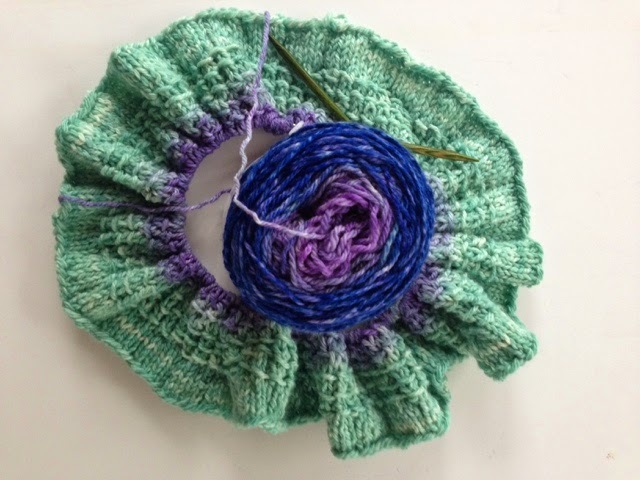 Vogue Knitting Live: Part II: Who Said Knitting Isn't Art? 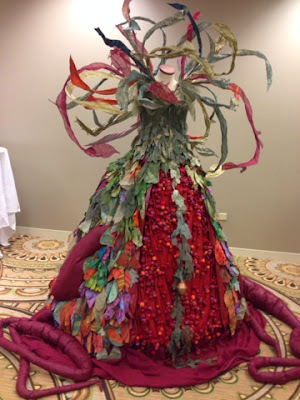 This is an actual, wearable dress by Betsie Withey, a textile artist based in Grand Rapids, Michigan. Betsie had a photo showing a model in the dress. It is amazing on. It is also very hot, said Betsie, who is working on making similar garments that are more wearable. Betsie uses free-motion embroidery, knitting, crochet and hand embroidery to create garments and hair accessories. She also makes large-scale sculptural dresses and hats. Her style combines make-believe and nature, and her Etsy shop is called The Faeirie Market.You can see -- and buy -- more of her work here and here. Art can be kitchy, too, don't you think? I do. 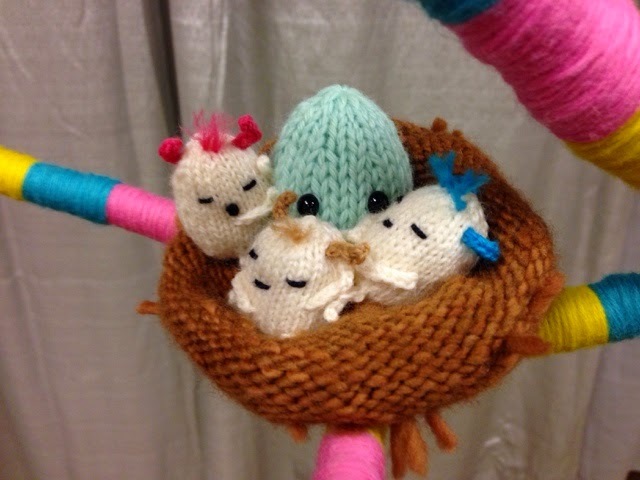 One of the amaguri knitting queens attended Vogue Live and it was SO much fun to see her creatures in the wool. This installation was assembled by Anna Hrachovec, author of at least four books featuring adorable "mochimochi" patterns. You can make toys ranging from tiny to large using her directions. I have admired her books for years so it's just a matter of time before I knit up some of her creations. You can learn more about Anna here. 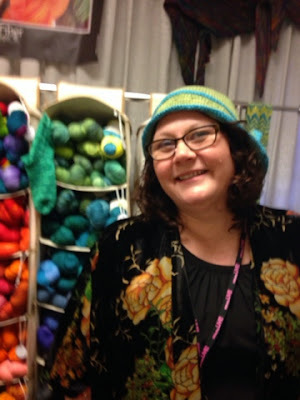 Last week I received an email from the Madison Knitters Guild saying that there were a few more seats left on the bus going to Chicago for Vogue Knitting Live. What the heck, I figured, it would be fun just to go and see what it's like. 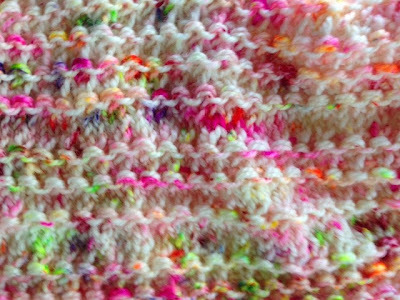 So at 7:30 a.m. Saturday, I climbed onto a bus with 50 other knitters and headed south. First, the event is held in the elegant Palmer House Hotel in downtown Chicago. Everywhere I went in the hotel, there were people knitting! Is this was heaven is like? The fashion shows were fun, although the models were so young and so slim that they would look gorgeous in anything! Like Lynn at Mia Bella, which is located in Highland Park, a northern suburb of Chicago. She isn't the owner, but she is the namesake of the very cool sock pattern she's holding. This booth offered amazing patterns that matched their own dyed yarn. (I may have bought something, but that's a story for another post...) A lot of the sellers used that idea of selling yarn with their original patterns. If I am any measure, you'd have to say that this is a smart marketing tactic. Laura hails from the Ithica, New York, area. When I found that out, I immediately asked if she ate at the famous Moosewood Restaurant there. "No," she said, "I can make that food at home. It is where visitors always want to go." Well, this seems like enough for one post. Exactly what did I buy? Tune in again to find out! 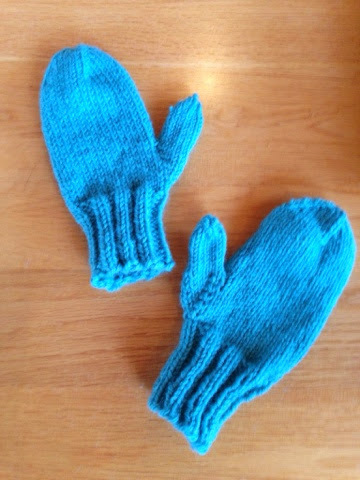 I finished these Meeting St. Mittens in record time: two weeks! I used Berroco Sox yarn. I had read on Ravelry that this yarn is a bit thin for a sock yarn, and I would agree with that assessment, but it worked out fine for this pattern I made one major adjustment: It looked like the mittens might be too long for me, so I cast off with 24 stitches left and joined them with the kitchner stitch. I think they look better without such a pointy top. There is something so addictive about this pattern. I have already started the next pair -- using a different yarn with different colors. People have told me that the pattern is very counter-intuitive, but I haven't found that at all. Actually one of the things I like about Babies & Bears is that I understand the construction so I feel like I'm making fewer mistakes than I usually do. I'm hoping today will be a better day at work than yesterday, when I locked my car keys (along with my lunch and, most importantly, coffee) in my car, and then proceeded to lose track of my classroom key! By the end of the day, everything was back in place, but it made for a stressful day. I felt off-kilter until I had my keys back. Don't forget to check in with Keep Calm Craft On. You may recognize Elizabeth Strout as author of the award-winning Olive Kittridge, a novel in connected short stories. She creates characters that you believe exist and does so with graceful language. Although she is best known for Olive Kittridge, I feel that her first novel, Amy and Isabelle, is even better. 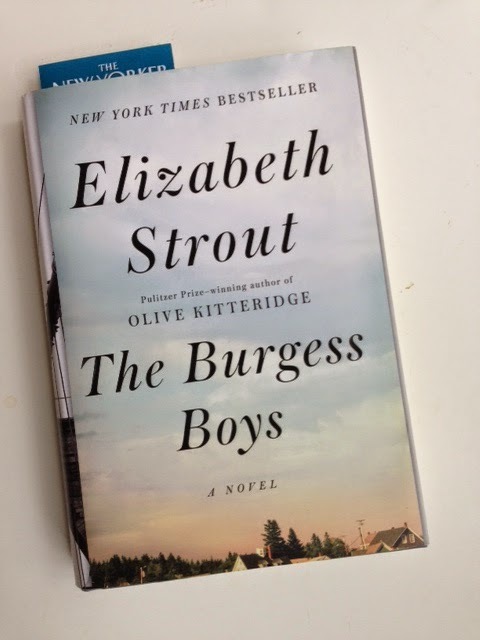 The Burgess Boys is not her best, in my opinion, but it is worth reading. Each night, I looked forward to picking it up and joining the Burgess brothers as they struggled to reconcile the tragedy that marred their childhood with the places they landed as adults. Some of the characters in this book seemed a little far-fetched, but not enough to make me want to put down the book. Overall, it was a good read. I also read To Rise Again at a Decent Hour, by Joshua Ferris. This tale of a dentist who becomes obsessed with an anonymous blogger who takes in the dentist's identity online received great reviews. However, I was disappointed in it. Maybe I'm just not deep enough. The story is almost a parable about religion and about real versus virtual worlds. The story seemed to bow too much to the themes he was pursuing. On the upside, I flossed more regularly once I started this book. But, I must mention his first novel: And Then We Came to the End. This is the only book told in the first-person plural (we) that I enjoyed. It's a humorous workplace story that unearths some of the truths of the daily grind in the current capitalist market. This is a book to savor. 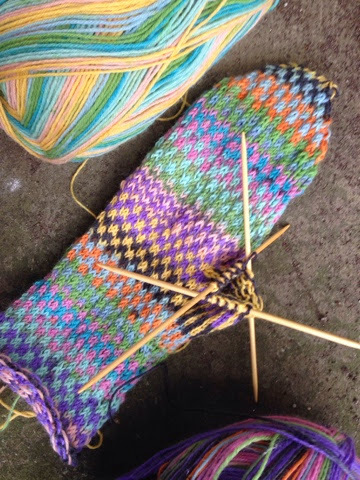 I am still enjoying this mitten. Thumbs are always kind of fiddley, but I've gotten to the point where they are managable! I'm writing this on Wednesday at lunch -- the week is half over! I was at school from 7 a.m. to 7 p.m. yesterday. I know I shouldn't do that. I am so tired the next day! Tonight I'm meeting a friend for dinner so that will get me out of the building in a more timely way. Don't forget to check in with Ginny at Small Things. 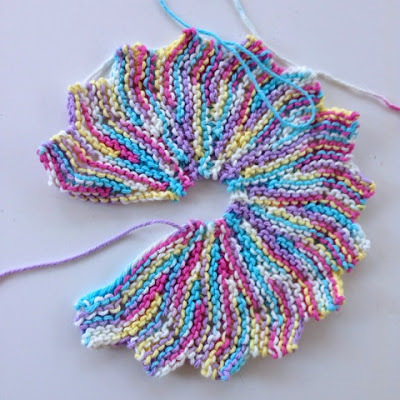 Self-striping yarn can create amazing and surprising things. These two skeins of Berroco sock yarn look like they would clash, but I am loving the way the colors are working together. I should add that at one point I had to cut one of the strands because they both were the same shade of green, so I would have lost the pattern to an awkward green patch. 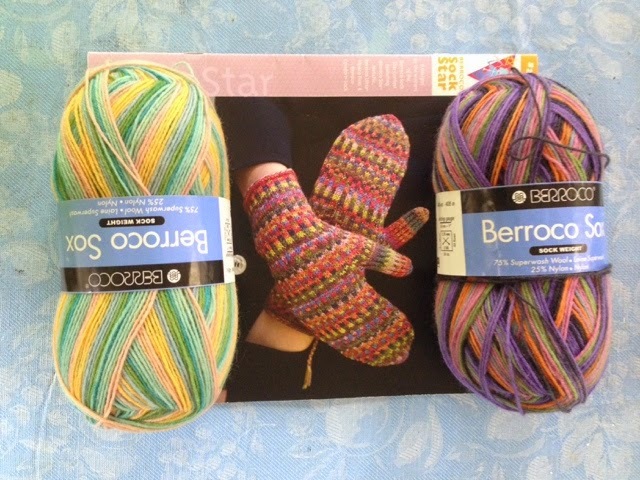 The pattern is Meeting St. Mittens from a Berroco booklet titled, "Sock Star." I don't really like any of the other patterns, but it was worth to price for this pattern along. I suspect I'll be making more pairs. I'm still a bit under the weather, but after missing all the fun last weekend, I'm enjoying this one if it kills me! Went to a party at a friend's house last night, and tonight I'll be eating dinner in another friend's Sukkah. My friend Lisa has some photos in a show, and I'm going to the opening reception on Sunday. I hope you are having some fun this weekend! I've eyed this pattern booklet for months, and it went on sale the other day. I figure that was fate talking to me. 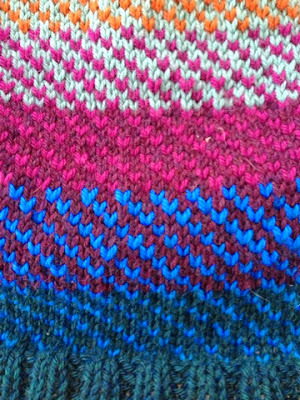 I love patterns that combine random-seeming yarns. And I love mittens. I am hoping to improve my fair-isle knitting skills. 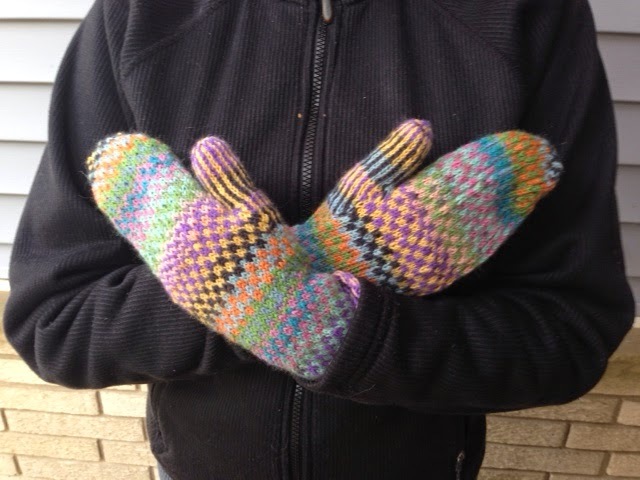 Even though I have done a pair of salt-n-pepper mittens, I'm still very slow and awkward. We'll have to see how that goes. I've been AWL again. This past week, I thought work was going to kill me! I came home every night and was asleep by 6 p.m.! Ridiculous. When I woke up Saturday morning, I realized that the dry throat that had been bothering me was really a sore throat. Yes, I'm a little slow. I was sick all week! Yesterday was Yom Kippur, the Jewish Day of Repentance. Sadly, I had to cancel my dinner for that evening; I've been putting a Break Fast for those who actually fast, for more than a decade now. I hated to cancel, but a) it was clear that I didn't have the energy to put on any sort of event; and b) it wouldn't be very nice to spread the germs. Instead, I spent the day napping and knitting -- not so bad as a consolation prize. The first piece of the Babies and Bears Sweater is coming along nicely. 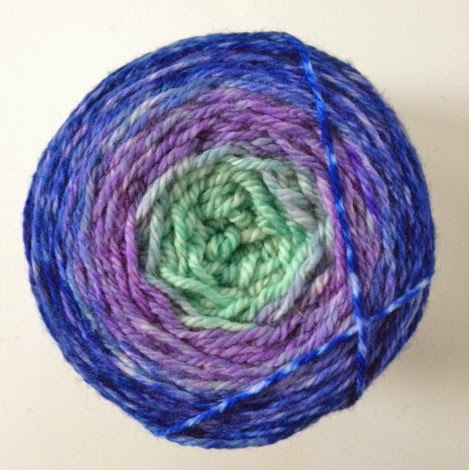 The yarn is Encore Colorspun worsted, color 7749. My friend Marsha, who has knit countless sweaters, recommends Encore for babies and kids because, she says, it is soft, durable, and washable! 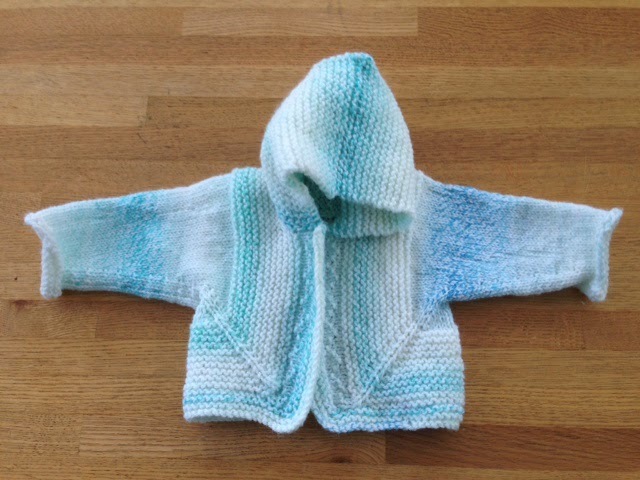 I'm not knitting for any baby in particular, so I chose the most unisex color I could. I think this white with bluish/green streaks would be OK for a boy or a girl. I do have two pregnant people in my world, so it will definitely have a home when I finish it! I think I'll make a cup of decaf and catch up with all of you. That's something I can do in bed! Boy, does it feel good to be home this evening. Even after a restful Rosh HaShannah yesterday, it was still a jam-packed week. So, I'm focusing on both a book and knitting project that are relaxing. Tomorrow is my birthday so I feel I deserve some R&R. The sock is the second of a pair, a Hermoine's Everyday Sock. 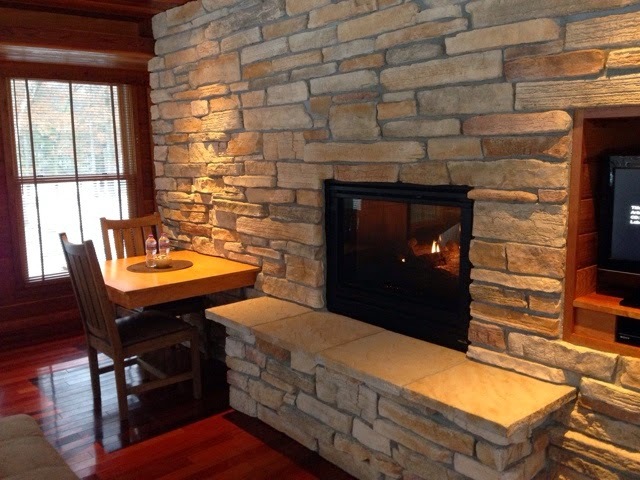 Even though we are having warm weather now, winter is just around the corner in Wisconsin. (Though, according to the New York Times, the Midwest will be much warmer in another 40 years.) This will be a fun pair to wear with Birkies. "We tend to be particularly unaware that we are thinking virtually all the time. The incessant stream of thoughts flowing through our minds leaves us very little respite for inner quiet." (p. 9) I think that's what is called Monkey Mind, which seems to be my default state. Earlier this week, I had the honor of meditating with monks and nuns from Plum Village in France. Plum Village is the monastery established in the late 1960s by Thich Naht Hahn, who is second only to the Dalai Lama in the world of mindfulness. It was so thrilling to be in the same room with "sisters and brothers," as they call themselves. It reminded me of how I felt when I saw Bob Dylan in concert in 1978! If you have ever wondered what this mindfulness stuff is all about, the first book you should look at is Peace is Every Step by Thich Haht Nahn. It is life-changing stuff -- and a smooth, poetic read to boot! Earlier this month, I blogged about how I want to make the Harriet Sweater. I bought the yarn and pattern at the Wisconsin Sheep and Wool Festival. 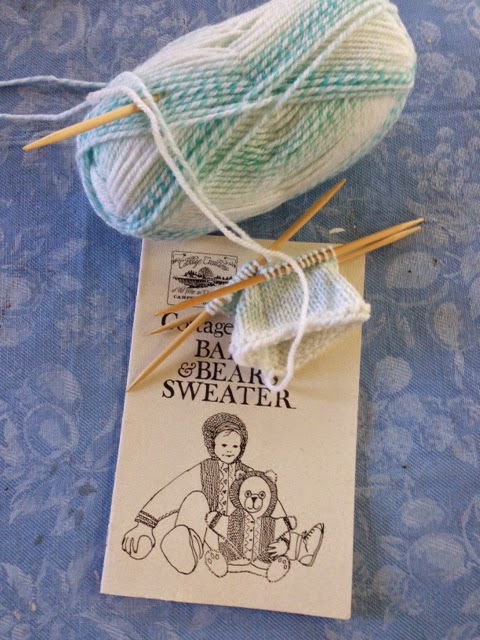 Lucky for me, my partner in yarn accumulation saw that the Harriet Sweater is adapted from Cottage Creations' Babies & Bear Sweater, so I picked up that pattern, too. For once, I am going to think before I plunge into a major project. 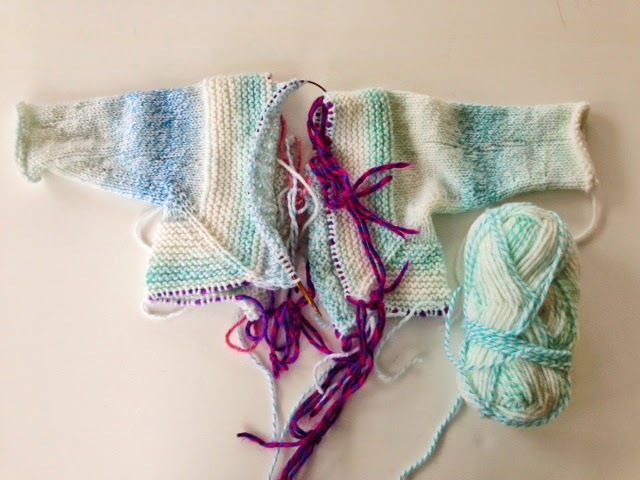 I am going to make the baby sweater first. I think it's a good idea because the construction of the sweater is unique: You knit it in two halves, beginning with the cuff of each arm, and then you use the Kitchner stitch to sew the backs together. 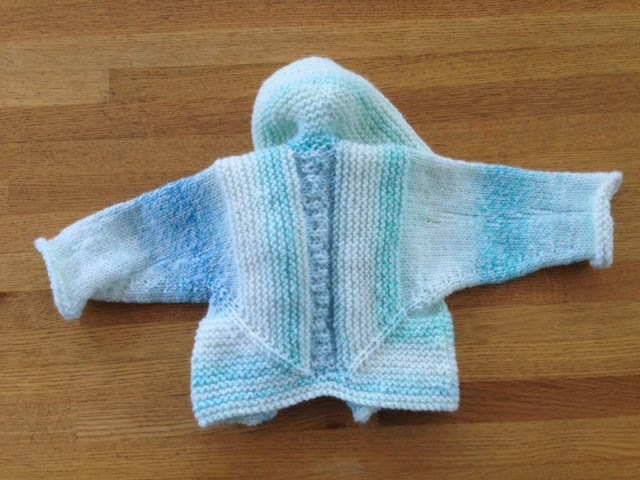 Suzy has made the baby sweater before and assures me it's a bit strange but not too hard. Besides, I just felt like casting-on something new and different. This school year is shaping up to be a challenging one, so I wanted to treat myself. It's a hectic week with the Jewish New Year starting tonight. I will take off Thursday to observe the holiday, which I always enjoy. Still, it's hard to miss a day at school. Special ed students, even more than other middle-schoolers, crave predictability! I'm linking up with Ginny for Keep Calm, Craft On. These first three weeks of school have been pretty draining, so I've been embroidering towels to unwind. In a way, I hate using up time on pre-made patterns, but they are so cute and will make sweet gifts. There is something soothing about these mindless projects. I've been knitting, too, but I didn't want to feature the same project over and over! This morning a bunch of people from the writing program I participated in this past summer got together to begin a writing group. It was amazing. We had a great turnout. We started out by writing from a prompt one participant brought, and shared. Some of us brought in pieces that we've been working on. I almost didn't share mine. But the others encouraged me, and then gave me feedback that was both useful and supportive. We're planning to meet monthly. Maybe I will actually finish this short story! We're having company tonight, so the house is clean! Isn't that a great feeling? I was busy all day, so I hope to have a more relaxing day tomorrow. It's called Holi Festival, but I would call it Spun Sugar. There is something so yummy about it. And before I left the store, I knew what I was going to do with it: Make the cowl that one of the salespeople was wearing. It's called the Jet Set Cowl, and you can see it here. Paulina Popiolek is the designer. I had never heard of her before, but she has some amazing designs. Check out the Ho'okipa Shawl. Not only is it gorgeous, but it's named after one of my favorite beaches in the world. (It's on the north coast of Maui). Check out what everyone is knitting at Ginny's blog.